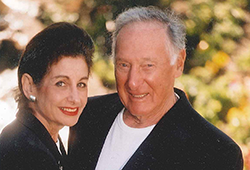 Sy and Carol Danish established the Danish Family Endowment Fund at OJCF in 2006. Seymour "Sy" Danish z"l passed away on May 25, 2014. After 96 years of life devoted to his family and his community, he is remembered for his remarkably generous spirit. "We are proud to share the legacy of his IRA designated gift to OJCF, where funds have already been earmarked for improvements and opportunities within our city. With this gift, Sy's memory continues to instill the importance of tzedakah to his children and grandchildren," commented Carol Danish.